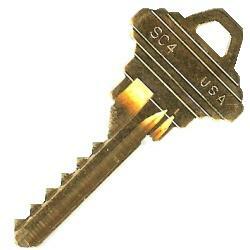 A bump key is a special key that has been cut to work with the mechanics of pin tumbler locks. A bump key does not follow the proper key cutting that is designed to properly align with the key pins. Instead, it is cut with low peaks and wide valleys that are designed to force the pins through an impact, hence the name, “bump”. They are used, sometimes in the hands of the wrong people, to pick a lock and gain entry. It is estimated that more than 95% of conventional home and business locks are vulnerable to being picked using a bump key. Depending on the lock, how often a bump key has been used on the lock, and the amount of force applied, bump keys have been known to leave permanent damage to the lock. The key pins and the driver pins are inside the same pin hole. They are pushed together by a spring to prevent the core from rotating. When you align the key pins and the driver pins to allow a separation between the two pins to align with the separation between the core and the housing, you create a shear line. The shear line allows the core, or plug, to rotate inside the cylinder. When the properly cut key is inserted into the keyway, the key aligns the gaps between the pins with the edge of the lock core and pushes the pins into alignment along the shear line. This allows the core to be rotated and the bolt work to be retracted and unlocked. If you insert a key that has not been cut for that specific lock, the gap between the pins will not line up with the gap around the core, so the core will not rotate because the shear line has not been formed. A bump key can be made using a key that already fits a specific lock, or some are even crafted by burglars in their home. Once made, the bump key is partially inserted into the lock so that one pin, or notch, stays between allowing full insertion of the key. With very little movement of the bump key, it is eventually fully inserted, relying on the spring tension of the pins to align the bump key. The person using the bump key then applies an impact force, referred to as a bump, to force the key deep into the lock. When this force is applied, the key pins jar, and the driver pins jump for a split second, aligning and creating a shear line. Once the shear line is established, the lock can be opened. Is Lock Bumping the Same as Picking a Lock? Lock picking requires patient skill that usually leave little or no damage to the lock. Bumping a lock, however, relies heavily on the actual bumping technique, that ultimately forces the lock open and can damage the lock in the process. Most professional locksmiths are equipped with the proper tools needed for opening a lock without leaving any damage to the locking mechanisms or the outer assembly of the lock.